Still image of the anterior view of the human heart with transesophageal echocardiography (TEE) ultrasound plane positioned in the Mid Esophageal Right Ventricular Inflow Outflow View. 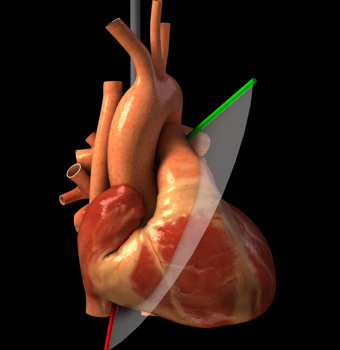 This image is part of an interactive module that helps learners better understand the relationship of the two-dimensional ultrasound plane used in TEE with the three-dimensional structure of the heart. As a member of the Perioperative Interactive Education group at Toronto General Hospital, I worked on the development of online tools to supplement and complement existing educational methods used to teach transesophageal echocardiography. Visit the VIRTUAL TEE website to see this work.